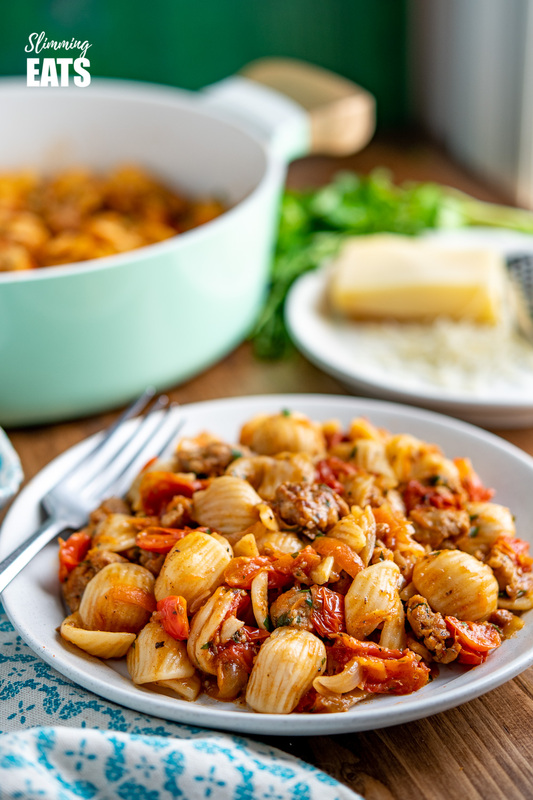 Sausage, Balsamic Tomatoes and Onion with Orecchiette – a beautifully flavoured pasta dish with the sweetness of fresh tomatoes and delicate flavour of herbs and fennel. Sometimes when you want a yummy pasta dish on the table, it can be all too tempting to just open and dump a jar of ready made pasta sauce into a pan and voila you are done. 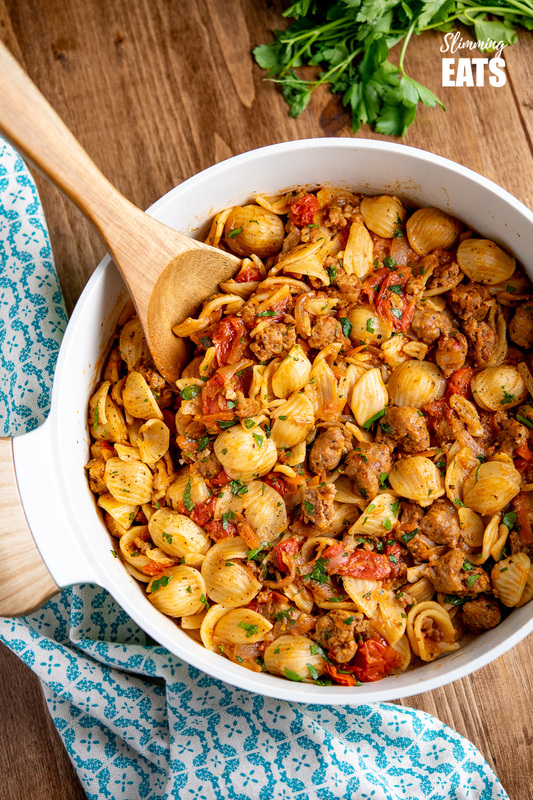 While there is absolutely nothing wrong with that (there are some pretty healthy jars of pasta sauce out there nowadays), it’s really simple and quick to throw together a family friendly pasta dinner with fresh delicious ingredients. I love making pasta dishes with fresh tomatoes, they have an amazing natural sweetness and none of the acidity that you often get with canned variety. Yes I know it means chopping, but it really doesn’t take more than a few extra minutes and you don’t need to remove the skin. I just leave them on to keep it nice and simple. 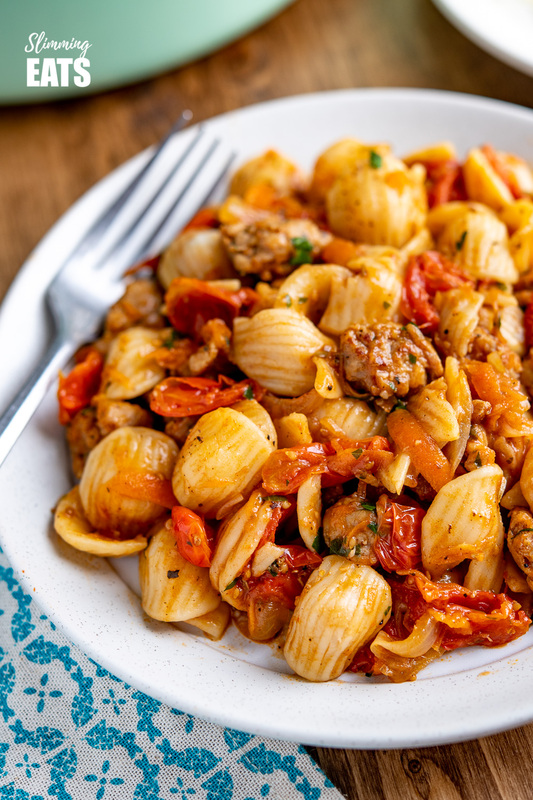 Grape or cherry tomatoes are my preferred variety for this Sausage, Balsamic Tomatoes and Onion with Orecchiette recipe, but any fresh tomatoes will work. 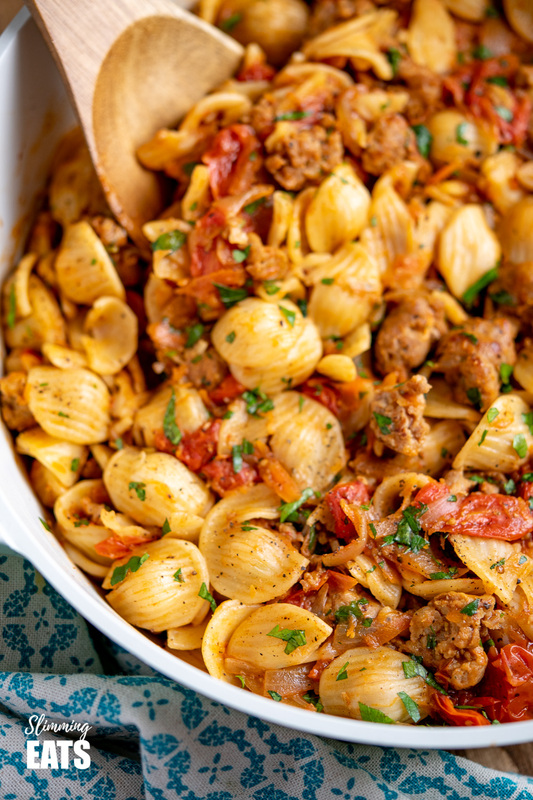 You don’t need to use the orecchiette pasta, it was what I had on hand when I made this, so don’t feel the need to go out a seek some of this pasta, if you have penne or fusilli or even spaghetti, they will all work fine. The only difference really is the shape. The sausages you use of course will vary where you live. 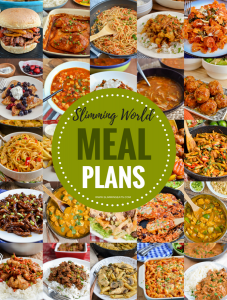 Just choose the lowest in syn variety that you love, we are adding plenty of flavours, so you don’t need to go and seek out a special kind of sausage for this. I remove the skin from all the sausages, so you just have the sausage meat, we are chopping up the sausages in this pasta dish, so they are best with the skin removed. You could actually even make up some of the mix for these sausage patties and use that instead if you prefer. 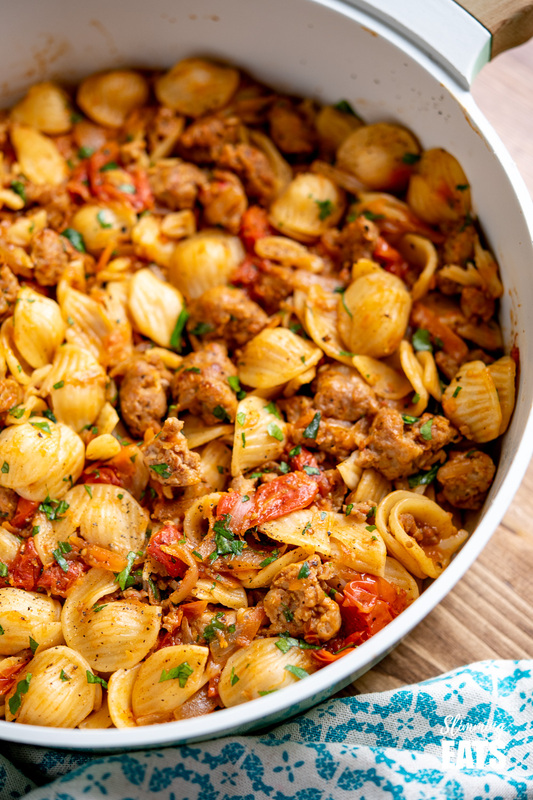 How can I add a 1/3 speed foods to this Sausage, Balsamic Tomatoes and Onion with Orecchiette? There are some speed foods in the pasta dish, but I always serve this alongside a mixed salad of crisp lettuce leaves, cucumber and shredded carrots for some additional speed food. 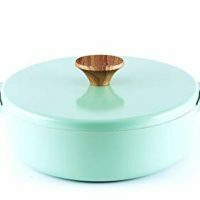 We always serve this in the middle of the table with a huge mixed salad bowl for everyone to help themselves to. The kids eat some much better and healthier when they can pick what they want on their plates. 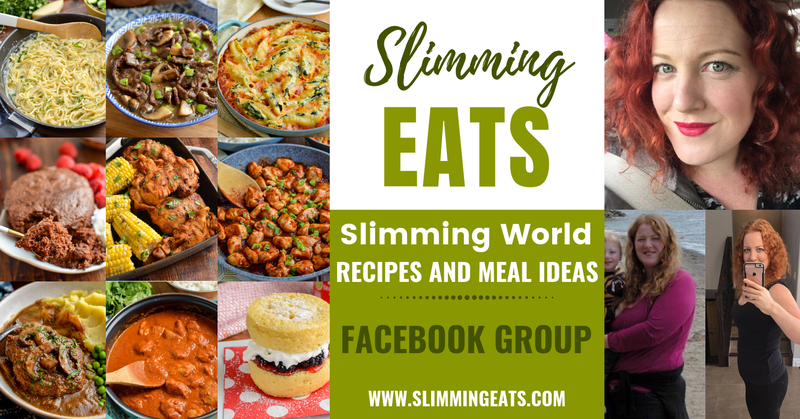 You can add all kinds of different things to the salad too – cucumber, tomatoes, peppers, onion, beetroot, different types of lettuce (arugula, romaine, spinach, baby leaves etc). I love a few olives too, not a speed food, but yummy all the same. 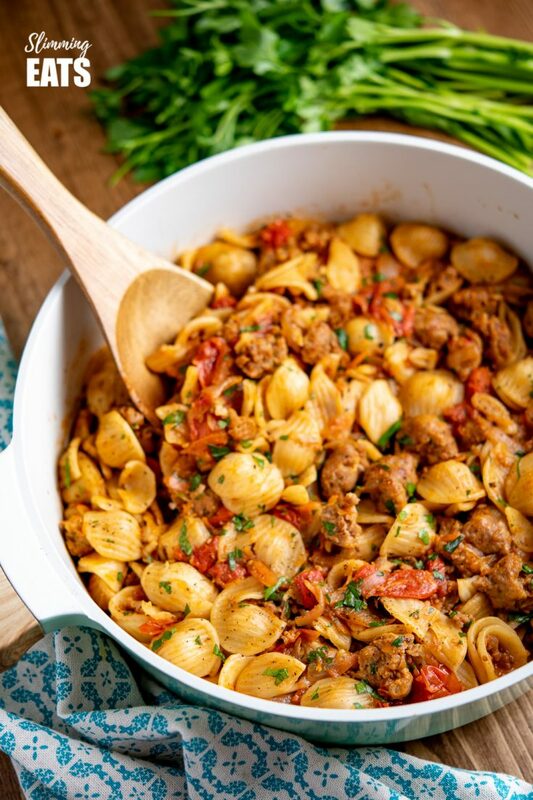 Sausage, Balsamic Tomatoes and Onion with Orecchiette - a beautifully flavoured pasta dish with the sweetness of fresh tomatoes and delicate flavour of herbs and fennel. Remove the casing from the sausages and roughly chop the meat. Add the sausage meat, season with a little black pepper and fry until lightly golden. Spray pan with a little more cooking oil add the onion and fry on a medium heat, until lightly caramelized, you may need to keep adding a little bit of stock to prevent from sticking. Add the tomatoes, carrot, garlic, crushed fennel seeds, oregano and basil to the pan and fry for a couple of minutes just to soften the tomatoes. Return the browned sausage meat to the pan, along with the balsamic vinegar, tomato paste, brown sugar and stock. Bring to a boil, reduce heat, cover and simmer for 15 minutes. In the meantime add the pasta to a saucepan of salted boiling hot water and cook until al dente. Drain the pasta and add this into the sauce once it has simmered for the 15 minutes. Toss to evenly coat in the sauce. NOTE: Syn Value of recipe may vary by sausages used. A lovely meal and certainly a keeper. Yummy!